INLEAD - Job Oriented Program | 100% Campus Placements | MBA and PGDM Programs: Time to say “WOW”! WOW Awards Asia is an initiative of EVENTFAQS Media - A multi-channel platform focused on the events, entertainment and experiential industry. The WOW Awards and Conventions 2017 concluded with two dazzling ceremonies on 6th & 8th of July. 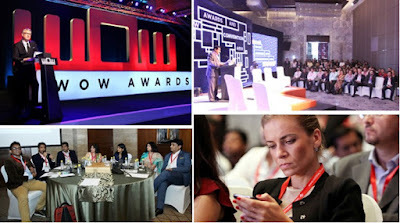 The Wow Convention was organized in Hotel Pullman, Aerocity and WOW Awards Asia – Gala Dinner at the JW Marriott Aerocity, New Delhi. The best campaigns in Asia in the experiential domain were recognized. The award ceremonies were hosted by Gitikka Ganju Dhar on Day 1 & Day 2 respectively and saw a total of 70 Categories across 5 groups -Business/MICE Events, Experiential Marketing, Event Intellectual Properties, Experiential Celebrations and Experiential Management. Group 1: MICE/Business Events - This Group majorly recognized events, tours, incentive of brands, associations, offsite etc. Under Mice, there were 8 categories. Group 2: Experiential Marketing - This group totally focuses on campaigns, events, initiatives of brands, associations etc. for a defined consumer with the purpose of promotion and marketing. Group 3: Event Intellectual Properties- Third group totally focusses on Intellectual properties work. With 9 categories, it includes activities done in relation with IPs; entries in this group can be made by the IP owner or any organizer. Some of the examples of IPs are: Tradeshows, sport festivals, Exhibitions etc. Group 4: Experiential Celebrations – This group recognizes different aspects of weddings, social events including design, décor, F& B, invitations, Guest relations and so on. Group 5: Experiential Management –The last group includes 12 categories that recognize the management and execution aspects of events across formats, celebrating the contribution of supply partners and vendors. Production management, trussing, lighting, sound, hospitality and logistics are some of the elements of an event that are separately recognised through Awards in categories under this group. Each year, with over 100 Marketers visits WOW Awards and Convention Asia, the one unanimous idea is to Explore New, Creative, and Dynamic Agencies setting the benchmarks in the event industry. WOW is one of the systematic and exclusive platform, making it possible.